There are many things to enjoy about the wonderful world of grandparenting. You have the exciting opportunity to see the world through a child’s eyes all over again – without the stress of juggling the many activities and obligations that parents have today. While Mom and Dad will do the hard stuff, and you can simply have fun with those kids. For all those grandparents reading this article know that we love you very much. There are many things to enjoy about the wonderful world of grandparenting. You have the exciting opportunity to see the world through a child’s eyes all over again – without the stress of juggling the many activities and obligations that parents have today. Grandparents have the luxury of an afternoon of board games or an evening movie marathon, much to the grandchildren’s delight. There are many ways to get involved with your grandchildren, but sometimes the prospect of nurturing that relationship can be daunting to someone who is trying to bridge the gap between two very different generations. It is hard to understand kids of any era, but it is particularly challenging when you have not had the advantage of visiting that realm for many years. The good news is that there are many ways for you to connect with your grandchildren, and build wonderful relationships that you will all treasure forever. If you live in a different state than your grandchildren, the ability to stay close to them is compounded by the distance as well as the age difference. You may only be able to visit your son or daughter’s family occasionally, and will need to find other ways to stay in touch with the grandchildren. Today, the options for keeping distant relatives in close contact have blossomed into a wonderful array of methods for keeping in touch. Snail mail is still a popular and effective way for grandparents to talk to the kids. Sending cards, letters, pictures and other tokens through the postal service will give your grandchild something to look forward to, and make him feel important when he receives an envelope addressed specifically to him. Today, we also have electronic means of communication to choose from, and emailing the grandchildren can be a great way to keep in touch on their home turf of the computer. You can set up times to participate in your own private “chat room,” or you can simply shoot off a message whenever you think of one. Effective grandparenting requires that you stay in touch with the grandkids on a regular basis, but the method for communication is strictly up to you. 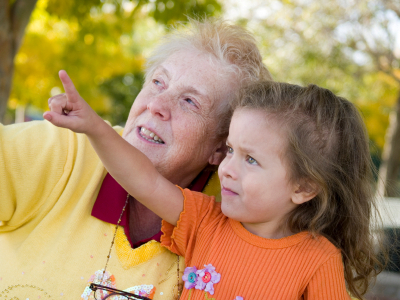 If you are fortunate enough to live near to your grandchildren, your grandparenting role can be much more involved. Perhaps you can spend a day with your grandkids at the zoo or museum, learning about their interests and sharing some of your own. You can even invite them over for an afternoon of “hanging out” time, which can include games, movies or participating in a favorite hobby that you both like. Kids become accustomed to moms and dads that must rush through life much of the time, and are almost guaranteed to appreciate the slower pace that grandparenting time can offer. It is also a good idea to try to spend one-on-one time with each of your grandchildren if possible. This allows each child the opportunity to enjoy some of your grandparenting abilities without feeling like he needs to compete with other siblings for your attention. This time together can be much quieter and more relaxing for both of you, and the benefits of private time can be far-reaching as well. Grandparenting is one of the most enjoyable jobs that you will ever be called to do. While raising kids is a wonderful experience, it must be balanced with discipline and the need to get plenty of tasks completed every single day. Grandparenting simply requires you to relish the time with those special children in your life. Mom and Dad will do the hard stuff, and you can simply have fun with those kids.